Instructions for Closers & Title Agents to complete an in-person closing with clients' Hybrid transaction. So you already understand how Hybrid transactions work and you're preparing for the closing. If you're acting as the Closer for a Hybrid transaction, take a look at the steps below to understand how you can access documents that have already been eSigned beforehand and the remainder of the closing documents that need to be wet-signed. 1. 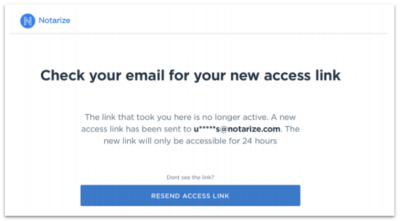 Look for an email from noreply@notarize.com. The subject line will contain the LoanNumber, Name of the signer(s), and “Documents have been sent for review.” If you don’t see it right away, you may need to check your spam or junk folder. Once you open the email, you will see a button that says "Download or Print Documents." 2. Click the “Download or Print Documents” button in the email. It will open and sign you into the Document Access Portal. Note: For security reasons, if the link is expired, the page will inform you that we have sent you a new link to the same email address. Click on the new link to get access to the portal. a. View the address, closing date, loan number, and borrowers. b. 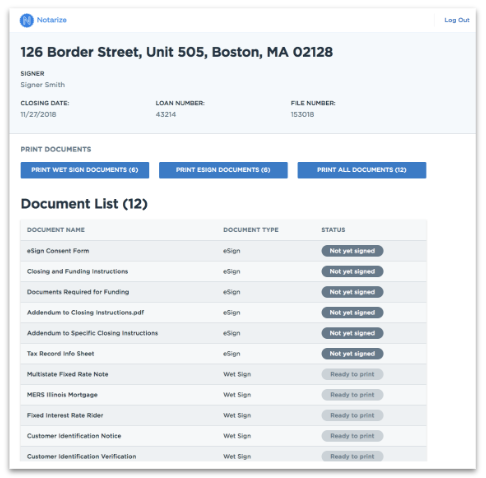 See the status and type (eSign or wet-sign) of each document. c. Download wet-sign, eSign, or all documents. 4. 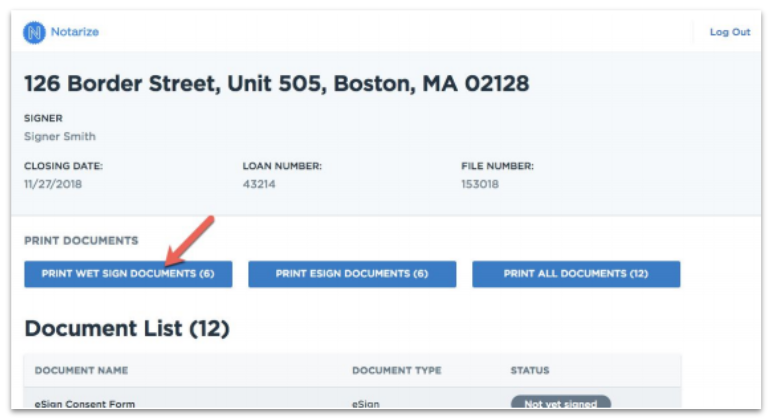 You can download or print the wet-sign documents using the “Print wet sign” documents button. This will open another tab in your browser with the PDF to download or print. 5. 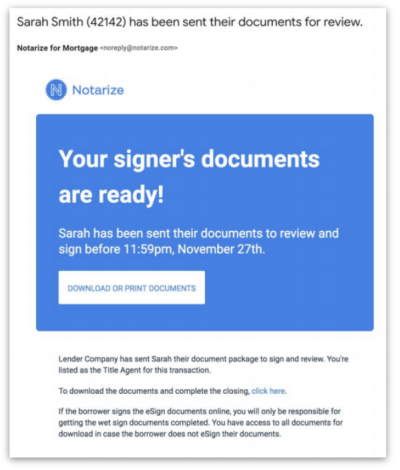 When the borrowers are at the in-person meeting to sign the wet-sign documents, it is very important to check the document access portal to verify that the eSign documents are complete. 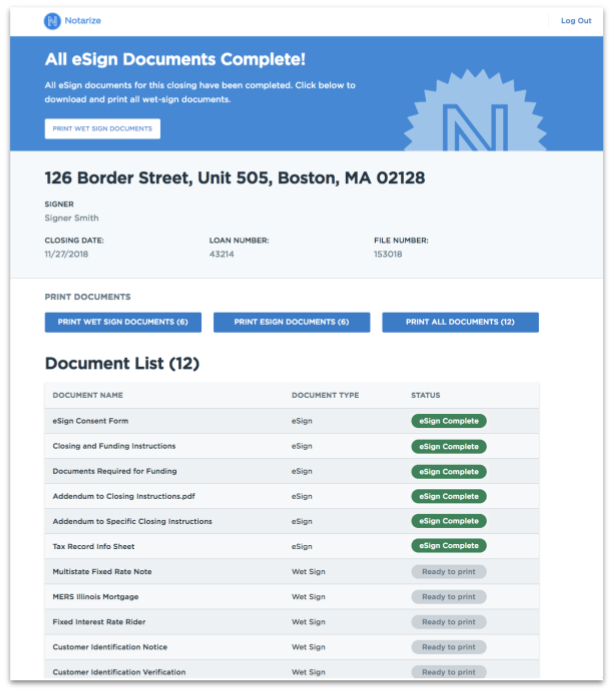 If they are, there will be a large blue banner across the top that says the eSign documents are complete, and each document will be marked as complete. The wet-sign documents will remain ready to print. 6. Once the wet-signed documents are complete, email the scans of the completed documents to the Lender. You must also overnight the original wet-signed documents to the Lender.